Michael Jacobs is the major injury concern for Wigan Athletic ahead of Saturday’s testing trip to Bristol City. 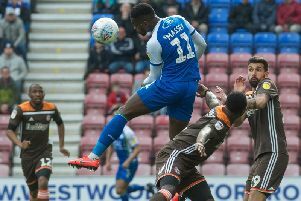 The in-form forward, who has missed much of the campaign through injury, pulled up lame again during last weekend’s 0-0 draw at home against Brentford. And boss Paul Cook is hoping he managed to substitute the 27-year-old before lasting damage was done. Jacobs’ absence would be a hammer blow, especially as Cook has only just been able to put back together his first-choice triple attacking axis of Jacobs, Gavin Massey and Nick Powell. “Hopefully he’ll be okay, because we’re in the nitty-gritty part of the season now where results are everything,” said Massey. “We need results, we need everyone fit, and you need your whole squad – those in the team and those on the bench – to pull together. “Everyone’s got a massive part to play between now and the end of the season. All three attackers have looked in the mood in the last two matches, against Brentford and Bolton, that have returned four points. And Massey admits it’s an attack he thrives on being part of. “Yeah a lot’s been made of the three of us complimenting each other well, and it’s going well,” he added. “Crackers likes to be involved in the play all the time, I like to stretch the play, and Powelly enjoys the freedom in and around. “It’s great to be back playing with those two - and there were times this season it might never happen again because of injuries to us all!